In this era of open data sources, open architectures and open APIs we'd like to suggest another open standard to apply in system developments, openHonor. 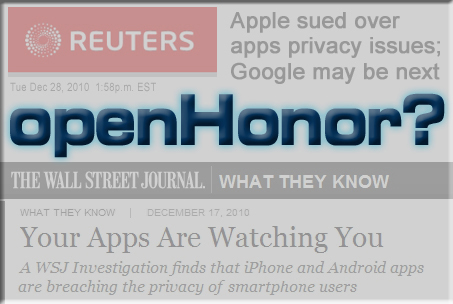 openHonor is based on the simple idea that information on or about your mobile device is yours to manage, to decide how it is used, by whom, how often and when. openHonor is our pledge to respect that. Our apps may sometimes need access to such data. Generally that would be for the purpose of the app itself but it may sometimes also include information to support an ad-based revenue model. Whatever the case, we will ensure that you understand what information we intend to access, for what purpose, how often and for how long. Your permissions will be respected against those stated uses-openHonor is also our pledge that we will make no secondary use whatsoever! That may seem self evident, but it is not how things work in any app market rght now, by and large. The right feedback on where your phone is, what apps are running on it, what clicking and searching you're doing, what you're sharing and what's being shared with you, all of these things help the ad men sell stuff. There is money to be made by apps that sell that data to them-with or without your blessing! Many apps, it is now proven, make this secondary use of your information after obtaining permission to use it for the app. Many developers even go so far as to ask for permissions that seem completely unrelated to the purpose of their app! It is not, at all, that we are against conducting an honest trade and making just profits. Even for the ad men. We are unrepentent capitalists, but this practice has a slimy feel to it. If its all good, why is it done so secretly? Click here to read the Wall Street Journal coverage of this issue. It just doesn't seem seem right to us and we won't do that-ever. Data will not leave your phone without your expressed, concurrent permission. That is the third tenet of openHonor. Advertising is an important component in the revenue model of any app developer and that is true of us here at DRAppLabs. But we regard you as the major stakeholder in how your information gets used and we'll make sure you know and approve before you use our apps. That's our openHonor pledge to you.